This quote from the David Brown letter, is really what started me on this journey. Genealogical records, including passenger lists, were just coming online in the early 2000s. 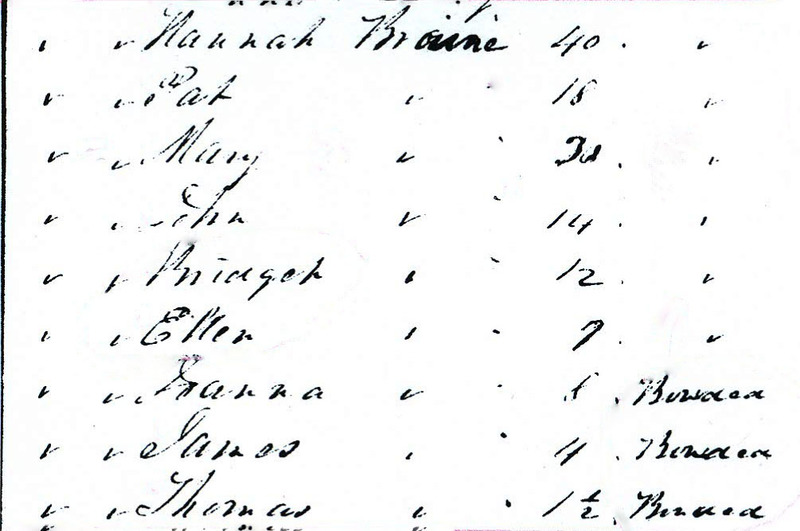 I searched websites available at that time, as well as volumes of passenger lists, and could not find all of the Browns identified in the letter in one passenger list - what we now know are Hannah Brown and her seven children. I had begun to think that perhaps they came over individually or in small groups which was quite common in the mid to late 1800s. I did find entries for two children showing the correct names and ages, (James, age 4 and Thomas, age 1), on the website of the New England Genealogical and Historical Society (NEGHS). What were the chances that these two little boys could be the correct family? 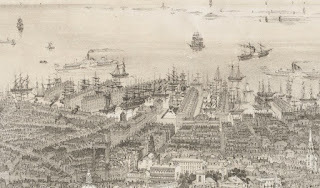 No other family members were listed, but, it did give a port, (Boston), an arrival date, (26 January 1849), and the name of the ship, (the John Murray). 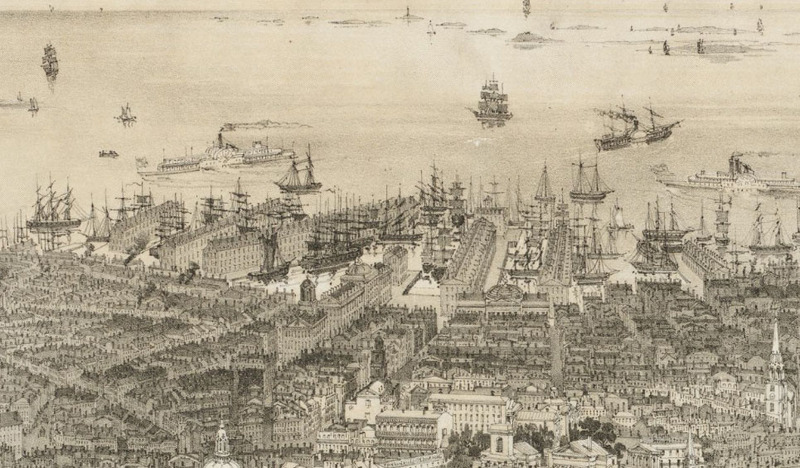 The David Brown letter named Boston as a possible port of entry, and, indicates that the youngest child, Thomas, often gave his birthplace as Boston. Those two children, if they were the correct ones, could not have traveled alone and I needed to find out who else was on the ship. Sometime later I had the opportunity to review the microfilm of passenger lists from the National Archives and Records Administration (NARA) for the John Murray. 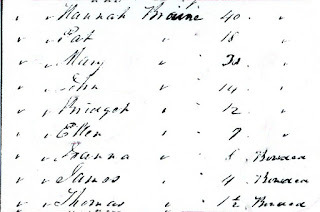 The image shown at the right is what I found.2 While the surname looked like anything but Brown, (it was indexed as “Broam”), there was Hannah (Honora) listed with all of the children. Some of the ages were a little different from the church records (see church records in Instant Gratification, and there was an additional child.3 However, the ship had arrived in Boston from the port of Limerick, less than fifteen miles from the family home. Also, recall that the farm in Fanningstown was given up to the landlord in December 1848. If that is when they left Ireland, a landing in January 1849 would have been about six weeks, average for the voyage at that time. This had to be the correct family. The famine had been raging since 1845 when 30 to 40 percent of the potato crop was destroyed. The crop failure was even worse in 1846. While the blight was not nearly as bad in 1847, yields were very low because not much had been planted. In August 1848, the blight returned and yield projections were grim.4 Things had been going very badly and it appears they were about to get even worse; so, it is easy to understand why the family decided to leave at that time. But, why would they have traveled to Boston on an American ship when the trip to Canada on a British ship, where most famine emigrants went to, was about half the cost of the trip to America? Passenger fares to the east coast of America ran from £3 to £4 for an adult and from £2 to £3 for children under 13.5 The total cost for Hannah and the children would have been anywhere from £22 to £31 (4 adults [13 and over – Hannah, Patrick, Mary, John] and 5 children – Bridget, Ellen, Joanna, James, Thomas). To put that into perspective, the annual rateable valuation for the 44 acre Fanningstown farm of John and James Browne, (assumed brothers of Timothy), in 1850 was £30.6 The cost of the trip would have amounted to the rent for the entire year. An average farm in Ireland at the time was seven acres. The Browne’s were more than average farmers. However, financing the trip required every cent they could have saved over the years or “borrowed” from others, and selling all of their belongings including livestock. British ships were notorious for poor rations, overcrowding and squalid conditions resulting in many deaths earning them the label “coffin ships”. Word from people who survived these voyages would have gotten back to Ireland. “To the United States go the people of good character and in comfortable circumstances . . . to British North America the evil and ill disposed. They go to Canada either because the faire is cheap or their landlords are getting rid of them.” 7 Conditions onboard American ships, while certainly not ideal, were more rigidly controlled. Although previous British regulations for transportation of passengers required that only 2 passengers per ton could be accommodated on the ship, most regulations were ignored and hundreds were packed into dark, wet, cramped spaces. The American Passenger Act of 1847 defined the amount of space required for each passenger and stipulated stiff penalties for noncompliance.8 Earlier Acts regulated the amount of rations to be carried for each passenger which were much more generous than British ships. The state of the ships may have been one reason the Browne’s chose an American port, namely Boston, but there may have been something more. A couple of years ago, I learned that the Massachusetts Archives kept a separate set of passenger records from 1848 to 1891 for the port of Boston. 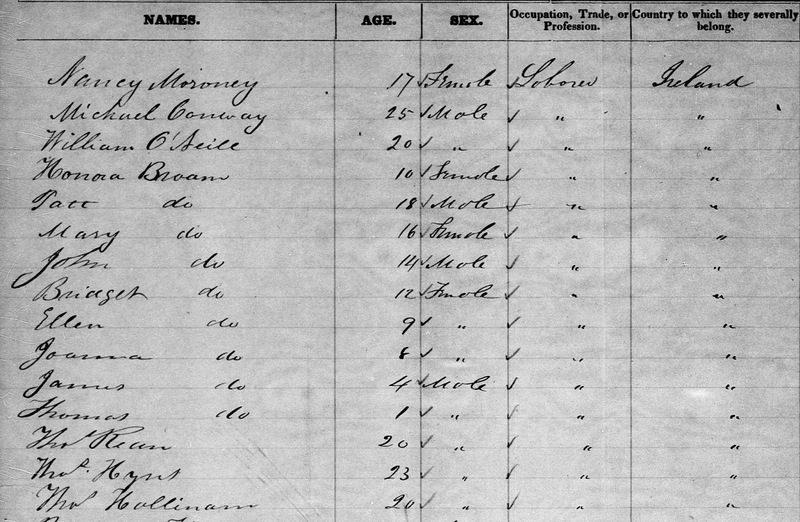 A copy of their records of the passenger list for the John Murray is shown above.9 Passenger lists for Federal records were taken upon embarkation at the port of departure. Passenger lists for the Massachusetts officials were taken by the ships purser during the voyage, and, at times, contain additional information. While the two lists (the NARA list and the Massachusetts list) are essentially the same, there are a couple of differences, the most pertinent being the indication that some of the family were “bonded” or pre-paid. The passage for three children, (under the age of 13), were purchased, probably, at the port of final destination before the John Murray left Boston for Ireland.10 This indicates the voyage was pre-planned, perhaps before Thady died in Ireland. “Someone” had purchased the tickets in Boston earlier and was waiting for the family to arrive. I have often thought that Timothy/Thady could have journeyed to America earlier in preparation for the arrival of the rest of the family, but, I have not found evidence to support this, and, all indications are that he was already deceased by this time. But, I keep looking. I only wish I knew who that “someone” was! In the next post we will take a closer look at the John Murray and the voyage from Limerick to Boston. 3. Most of the names and ages given for the children in the passenger list match the church records from Patrickswell. The Limerick Archives list did not show, Ellen; however, a record for her baptism has since been found. The differences, then, seem to be for Mary and the additional child, Bridget. Mary was baptized in 1837. Her age was given as 16 on the passenger list making her birth year 1832. She should have been age 12 at the time of the voyage. Bridget shows her age as 12 making the birth year 1836. Imagine the noise and confusion when embarking on the ship at the wharves. Perhaps the two girls were mixed up when the passenger list was created and Bridget should have been recorded as 16. Additionally, while reviewing the baptismal register from Patrickswell, I found a record for Brigidam Brown baptized 29 Jun 1832. She is the daughter of John Browne and Helen Kelly, who could be the brother and sister-in-law of our Timothy Brown in Fanningstown. There was not much future in Ireland for a young girl at the time of the famine and it would not be unheard of to travel to America and a new future with other family members. Could this account for Bridget? 5. Passenger fares for the “Black Star” line of packets from Liverpool to New York as advertized by WM. Gleeson and Co., Ship and Commission Agents, Limerick in the Limerick and Clare Examiner, July 22, 1848. 7. Woodham-Smith, Cecil, The Great Hunger: Ireland 1845-1849, Harper & Row Publishers, New York and Evanston, 1962, quoting the American Consul in Londonderry. 9. 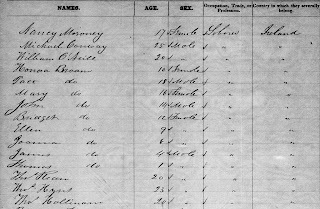 Passenger List, John Murray, January 26, 1849, Massachusetts Archives, Boston, MA. 10. Pre-paid passage could be purchased by anyone who could pay the fee. The normal process was to contract with an agent at the final destination for passage on a ship in their fleet. This is all fascinating as usual. I am interesting in knowing more about Bridget. She seems to fit in the age gap between children identified on baptismal records, and it makes me wonder if she was a child but somehow not identified in baptismal records. If she was instead a niece as possibly suspected, who could fit the gap in the children's ages? Perhaps there was an unrecorded stillbirth?